Andrea's World Reviews: Corset Chick Review and GIVEAWAY!! Corset Chick Review and GIVEAWAY!! I have always loved corsets. From 17th Century themed clothing to Gothic style corset and everything in between, I love them all. Corsets are just so beautiful. Oddly enough, as much as I adore corsets, until now I have never even worn one. I am not really sure why exactly, but I think much of it had to do with not being able to find a good place to get one. Good selection, quality and price are all huge factors for buying anything, but especially something like a corset. Thankfully, I found Corset Chick. Corset chick is such a great site. They have an enormous selection of not only Corset Tops, but of Corset Dresses, Skirts, Shoes, Sleepwear, Hose, Plus Size Corsets and more. The fact that they sell more than corsets is wonderful. 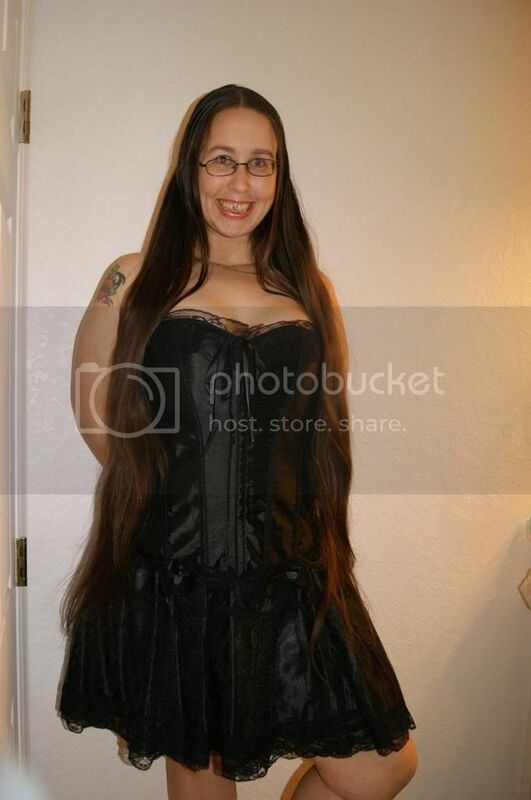 Being able to get shoes, skirts, hose and etc all in the same place as your corset it so awesome. I had the pleasure of trying one of their gorgeous corsets and one of their fabulous skirts(which when worn together t make a corset dress, or can be worn separately). The corset is so wonderful. It has hook and eye fastenings all down the front(not visible) and laces down the back to create not only the perfect fit, but to make it so much easier to put it on without help. It fits wonderfully without feeling too stiff or poking or anything. I could have done with one size smaller as this closed completely without having to compress, but I know that this corset would have held everything in beautifully had it been smaller. Like I said, it was easy to put on all by myself and it is surprisingly comfortable. The skirt is wonderful. It is 15 inches long and features an elastic waist to make it fit almost any size perfectly. If fits underneath the corset so nicely that is really does look like a dress. The skirt it so comfortable. I love that is is light and breathable without being to light or too sheer). I also really love that it is not too short. I would not wear a really short shirt, nor would one look decent on me. I love how well these 2 items compliment each other, but I also love how versatile each piece is, to be paired with other items too. I know I don't do this amazing outfit justice, but I love this "dress". It is everything I have always wanted and I feel so special when I wear it. It is just so much fun to play dress up in such a pretty corset. Every corset that Corset Chick offers is gorgeous, and I would love to have them all. I know this will certainly not be my last corset from them. If you are looking for a corset, then Corset Chick is THE place to go. You will find something perfect for a really great price, get super quick shipping and great service. Anything from Corset Chick would make a perfect gift for yourself or that special someone this Valentine's Day. And as a sweet(pun intended) gift for all of you, Corset Chick and Andrea's World are giving away one of these beauties. One winner will receive any corset of their choice (under $30, which is most every corset). Just enter below for your chance to win. Good luck. I love the leopard print!! I need one of these for over my dresses. They have a lot of stunning corsets. Beautiful! Love the black one! Love the spicy silver corset. I like the leopard one & the black rose one! Black Burlesque with Purple Stripes Corset. So many to choose from! I love the Army Camouflage corset! Or the Suede Cowgirl Corset! Pizza Fit'n Free Review and GIVEAWAY! Soda Sparkle Review and GIVEAWAY!